One technology that’s expected to take off next year is 5G connectivity. There’s a lot of hype surrounding the next generation of internet connectivity, evidenced by Motorola’s decision to launch the Z3; a smartphone capable of connecting to the 5G spectrum if a dongle with Qualcomm’s Snapdragon X50 modem is hooked up with the device. Qualcomm’s next processor, the Snapdragon 855 is widely expected to feature 5G support by default. However, some new evidence and reasonable conjecture suggest that this will not be the case. As mentioned above, Motorola and Verizon teamed up recently to launch the Motorola Z3 – a device that becomes one of the first in the world to support 5G connectivity courtesy of a Motorola Mod. The smartphone also features four different antennas on its sides to ensure that there is no signal blockage, further demonstrating the complexities that manufacturers will face with the next generation of mobile technology. It’s widely reported these days that the Snapdragon 855 will feature 5G connectivity. Qualcomm’s X50 modem that supports 5G is out, and that combined with the upcoming processor will ensure faster internet speeds with similar carrier packages. If you’re one of these hopefuls, we’ve got some disappointing news for you today. 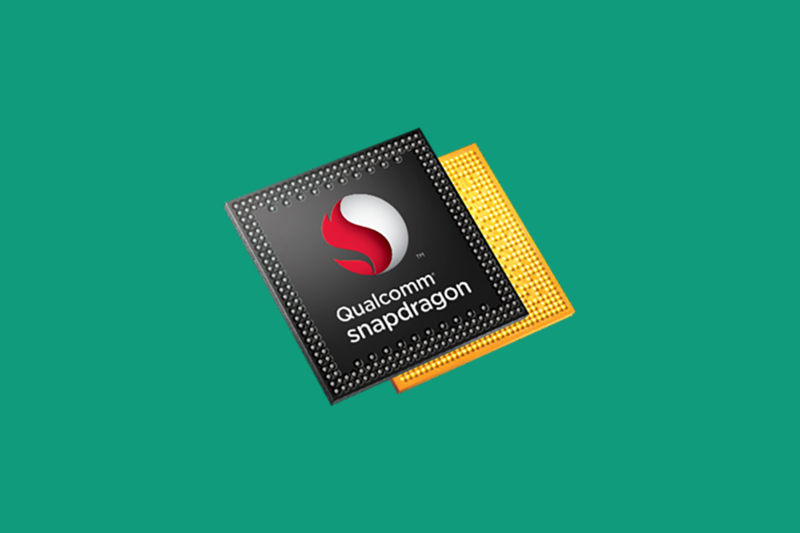 Starting off with on-surface technicals, the Snapdragon X50 modem is manufactured on the 10nm process – while the Snapdragon 855 will feature a 7nm die size. This itself will make sure that integrating the X50 into the 855 is impossible. Qualcomm’s rumored to launch its ‘Fusion Platform’. with the Snapdragon 855, that will provide 5G LTE connectivity as an added on feature. Now, we’ve got more evidence for this. Today we’ve got information from two Qualcomm engineers, that adds credence to the fact that the Snapdragon 855 will not feature a 5G modem as part of its package. The first is from Ahmed Saifuddin who has spent 19 years at Qualcomm and is the company’s Principal Engineer/Manager. Mr. Saifuddin lists his various accomplishments at Qualcomm and goes on to highlight the Snapdragon 855. He confirms that the processor’s modem is called Hercules and that he currently leading “MSIM Modem performance verification of Qualcomm cutting edge Hercules Modem (SDX24, SDM855) featuring Cat 20 LTE speed.” This makes it clear that the Hercules modem does not contain the X50, using the 7nm X24 instead. Ahmad goes on to mention 5G as well, but not directly in reference to the Snapdragon 855. 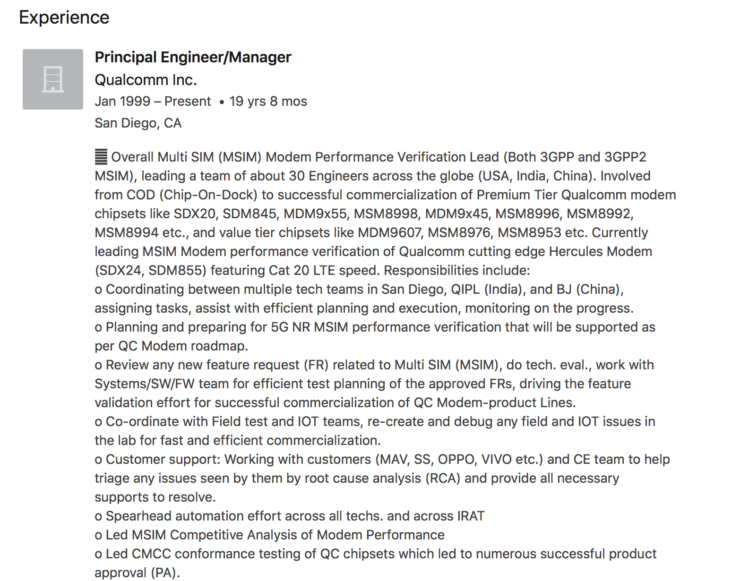 In a second LinkedIn posting, a software engineer at Qualcomm (Neo Chen), lists his responsibilities as “Customer engineering for VOLTE/IMS protocol stack in Qualcomm Snapdragon modem software“. He goes on to mention having held customer training sessions for the ‘SDM855” project, expected in 2019. These two listings, combined with earlier rumors look to confirm that 5G on the Snapdragon 855 will be a separate feature, which smartphone manufacturers will have the option to out of. Makes us wonder about Samsung’s Mobile Head DJ Koh and his plans for introducing a 5G smartphone early next year.